The Fund Management System for Excel is a step-by-step course for building a long term sector fund rotation model using Microsoft Excel. Microsoft's Visual Basic (VBA) language is used in conjunction with Excel's user interface, formulas, and calculation capabilities to deliver a powerful and flexible investment tool. The Fund Management System for Excel is based on the classic market economist's Sector Rotation Model, providing several crucial improvements that eliminate the guesswork in timing fund switches. Over long periods, the system can outperform diversified buy and hold mutual fund investing by a factor of 2 to 4 times. The automated Fund Management System for Excel incorporates three proven technical indicators - long term relative strength, moving average crossovers, and moving average slope, to identify the sector funds most likely to provide long term profits. The system can be used with any mutual fund, index fund, SPDR, ETF, future, or other index security to allocate capital to the most profitable sectors of the market. It operates with weekly CSV data files available for free over the Internet from Yahoo Finance, or an automated DDE data link if desired. Simply run the system on a weekly basis and make your investment decisions. A complete PDF Guide is provided along with a step-by-step Online Course so you can choose how to learn in the most comfortable way. Also included is a pre-built Excel back test model that allows you to test up to 10 different funds versus buy and hold over a 10 year period. A complete PDF Guide showing you how to build and use the model. A complete Online Course including everything in the PDF Guide PLUS VBA Code and FAQs sections. 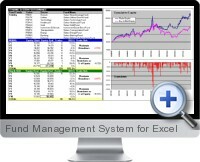 A complete pre-built Back testing Model in MS Excel with graphs and trade statistics for your historical analysis. 30 days of online access to download the materials and learn how to build and use your new Sector Fund Model. Instantaneous access to the PDF Guide, Online Course, and Back testing Model with your own login and password provided at time of purchase. Learn to integrate Excel, VBA, formulas, and data sources into a profitable trading tool. Acquire unique knowledge applicable to any Excel modeling or analysis project. Save money by eliminating recurring software costs. Calculate Buy/Sell signals on hundreds of funds within seconds.